For last nights game we skipped between the Pancake house and Buen Ayre to see how the different supporters were doing. 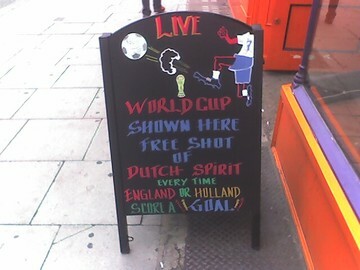 Despite the offer of free drinks for each goal the Pancake House was quite subdued - not too busy and no sign of Orange shirts. But it was 40 minutes to kick off. 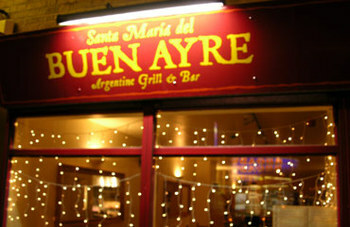 So we went over to Broadway Market to check out Buen Ayre, which was packed. Lots of Argentina shirts (mainly Maradona ones) and lots of buzz. Unfortunately the pictures didn't come out. If you want to see any of the Argentine games you need to book now - and I imagine they've already got bookings for the final. Another great steak restaurant, another Argentinian venue. La Piragua on Upper Street will be showing all the Argentinian games. In Broadways Markets Buen Ayre last night for an excellent steak and learned that they will be showing all the Argentinian games. At the moment they're debating how many TVs to get and where to put them but all the staff are adamant that the games will be shown. They've persuaded the one non Argentinian waiter (a Brazilian) to do all the work during the match, when they will just be serving drinks - their Parilla will get fired up straight after the games for a post match 16ox Argentinian Choriza steak. 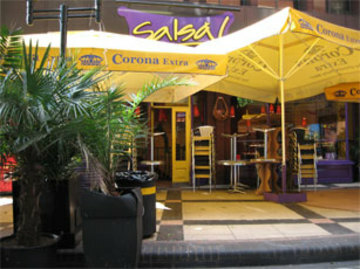 You'll almost certainly need to book - its packed most nights.